While we've seen some exotic PC mods in our time, most of those still dutifully stuff all the computer parts into a box, hiding them from the outside world. Martijn Laman isn't one for that kind of traditionalism. 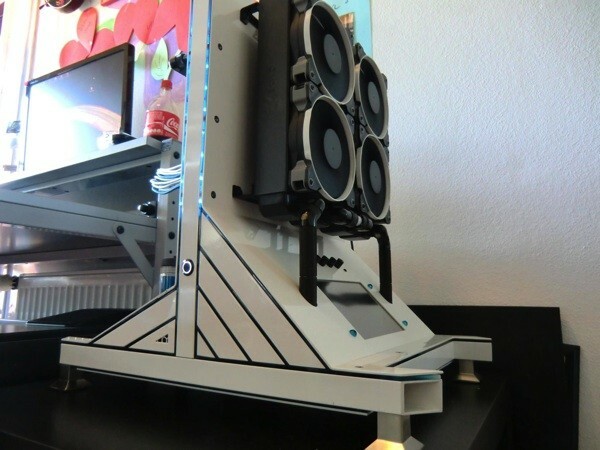 His recently completed Project Inverted, just highlighted by ASUS, puts most of the hardware on the outside: the Sabertooth Z77 motherboard, Core i5 processor, fan cooling, memory, Radeon HD 6870 video card and watercooling pipes all sit in plain sight. Everything is joined by a unique, hand-cut case whose backbone and elevated base hide the custom wiring, the watercooling pump, two solid-state drives and controllers for both fans and lighting. And did we mention the 7-inch touchscreen? The result is a truly special gaming rig that's relatively quiet and pristine despite baring its heart and soul for all to see. Building a replica won't be quick, nor will it be cheap at about €1,500 ($1,909), but Laman's detailed assembly process could well be the inspiration for a few more extroverted PCs.